Which consists mainly of two elements: An amplifier and an envelope (but not the kind Granny sends you letters in) to control it. Just like with oscillators and filters, the amplifier can be analog (Voltage Controlled Amplifier – VCA) or digital (Digitally Controlled Amplifier – DCA). 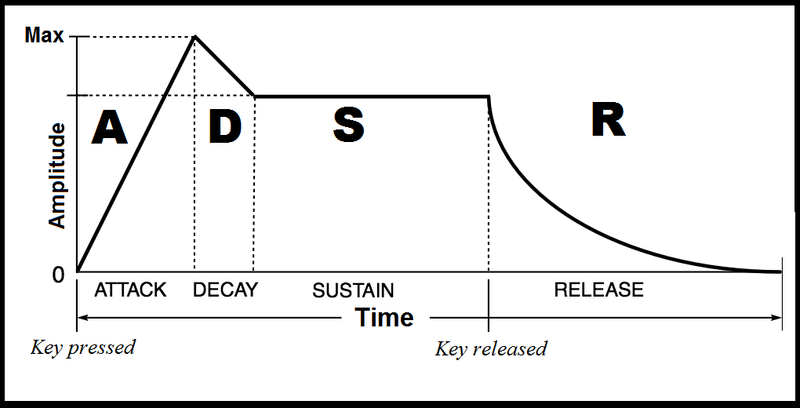 The envelope is used to define the behavior of the amp through time. It's the last processing stage before the sound leaves the synthesizer and, as we will see, it can have serious consequences. Depending on the settings of the envelope, sound can be more percussive or smooth, immediately or progressively audible, short and effective or long and atmospheric...or many other things. 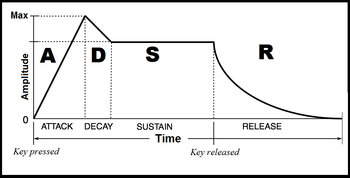 While there are many kinds of envelopes, the most common type has four elements: Attack, Decay, Sustain, and Release, and it is consequently called an ADSR envelope. The attack defines the time elapsed before sound rises to its maximum level. Here's an example of a sound with a short attack (meaning it reaches its maximum level right away), followed by the same sound with a long attack. Short attacks are best to create immediately audible, twangy sounds. On the contrary, pads and ethereal sounds require a longer attack time. The decay time determines the time required for the sound to go back down from its maximum level, after having reached the latter in the specified attack time. This volume reduction is not just an impression because if you say decay you say sustain reduction. The sustain is the volume level you want the sound to maintain after the attack and decay, and which ought to remain constant as long as the note is pressed. You have surely heard the sustain in the previous examples (the sound after the attack and decay, as I just said!). 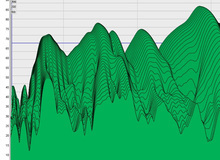 Here's the result of audio example 2 with a very low sustain level. Oh, yes, it's almost like a percussion sound! Finally, the release determines the time needed for the sound to turn off completely once you let go of the note. The release is triggered as soon as you let go of the note (or a "note off" message is sent to the synthesizer ─ which is something we'll come back to later on), even if the rest of the envelope wasn't played. For example: If the attack of a sound was set to 2 seconds, but the note was released after only 1 second, the end of the attack and the decay will be skipped, while the sustain period will obviously be non-existent. The only thing left will be the release. Logically, the attack, decay and release values are almost always in the milliseconds and the sustain value is often expressed in a scale from 1 to 10 or 1 to 100. The length of the sustain depends solely on the time the note is played, once the attack and decay times have elapsed. Some synthesizers feature variants of the ADSR envelope, like the Yamaha DX7, which features envelopes with eight parameters. Other synths have a "hold" parameter between the sustain and the release. It allows the musician to disengage the note and focus on other parameters of the synth without triggering the end (release) of the note played. This allow you to send particularly long messages, in order to create sonic pads or evolving effects, like wind simulations, for instance. While envelopes are usually found in the amp stage, they are also used sometimes to control the behavior of filters and even some other parameters and effects.